A fabulously provocative collection by women ready to destroy the joint. The twitterverse exploded with passionate, disbelieving and hilarious responses, and now here in Destroying the Joint women reply to this comment and the broader issues of sexism and misogyny in our culture. With Jane Caro editing, this entertaining and thought-provoking collection consists of essays, analysis, memoir, fiction and more. This collection of essays, edited by Jane Caro, was written in response to Alan Jones’s infamous announcement that ‘women are destroying the joint’ and the subsequent retaliation on social media. Covering everything from Julia Gillard’s misogyny speech to the difficulties of a nine-year-old girl understanding the abortion debate, it examines the socio-political atmosphere surrounding the discussion of equal rights, and how these power structures can be dissected, disrupted and destroyed. The collection traverses the political, environmental, economic and cultural landscape of Australia through diverse contributors, from Senators Christine Milne and Penny Wong to Melissa Lucashenko, Carmen Lawrence, Clementine Ford and Michelle Law. Of particular note are Monica Dux’s reflections on parenting in a patriarchal society, Lily Edelstein’s manifesto for teenage girls and Catherine Deveny’s 12 steps to destroying the joint. The plurality of these pieces provides the collection with a rich tapestry of shared experience. It acknowledges the diversity of feminist ideals as well as the common threads that bind us. 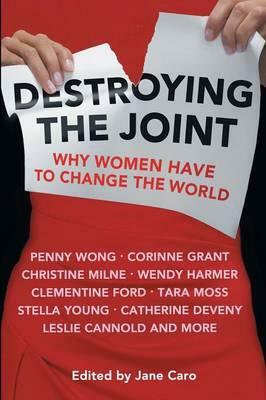 Destroying the Joint provides a fresh perspective on the female experience. It is an engaging read, littered with clever quips, fascinating political discussions, captivating life experiences and a good dose of humour. Highly recommended. Felicity Ford is a bookseller at Readings Carlton.